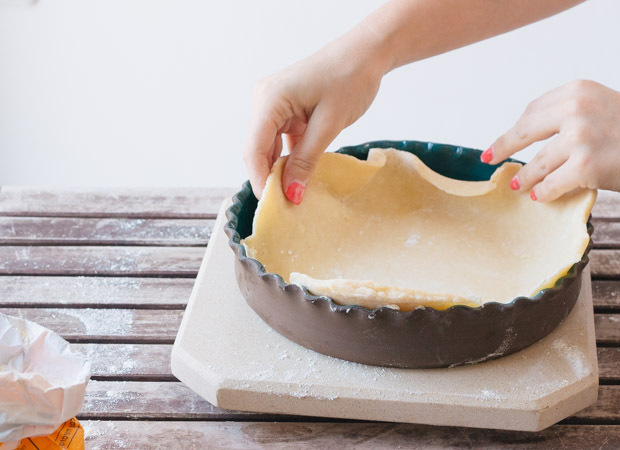 Perfect Pie Crust | Pretty. Simple. Sweet. Scroll down for step-by-step recipe with photos and a short printable version. 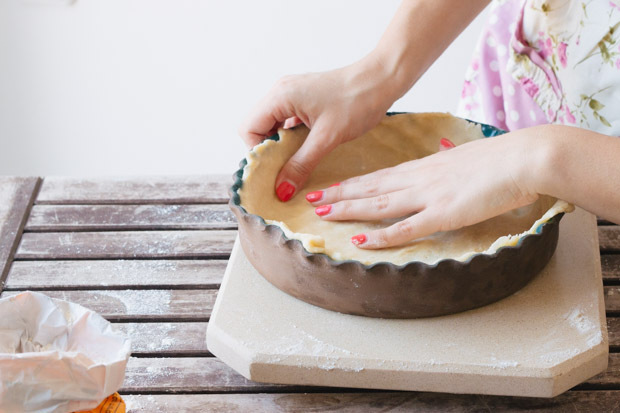 Everyone has their own favorite pie crust. I like mine buttery, crisp, and flaky. 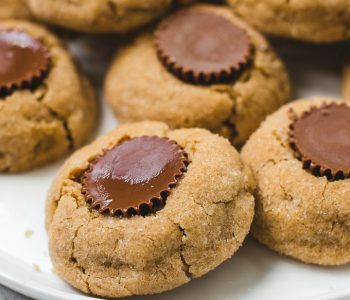 This one is an old, simple recipe that I’ve been using for as long as I can remember and it never fails me. When it comes to pies, I use this recipe almost all the time (although there are occasions where I like to mix it up a bit). I use this recipe more for pies than tarts. If you’re not familiar with the difference between a pie and a tart, then let me explain: pies have a crust on both the top and the bottom, while tarts have no crust on top. 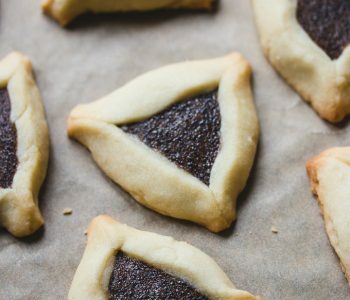 The recipe I use for tarts has a more cookie-like taste and crisp texture (don’t worry – that recipe will come soon 🙂 ). It’s important to use very cold ingredients when making the dough. Cut the butter into small cubes, then put it in the freezer for 15 minutes. 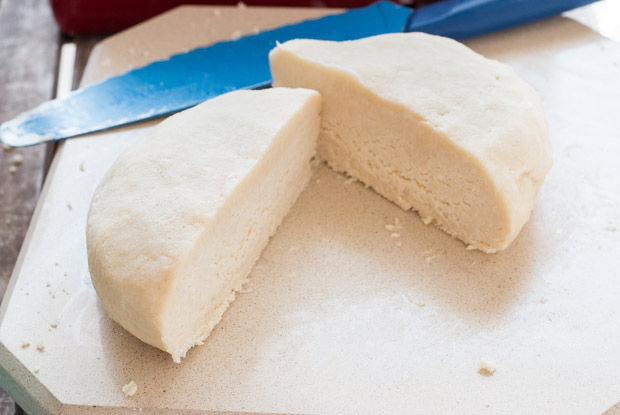 Same for the water and flour – measure the amount you need and place in the freezer to chill. For the water, you could alternatively add some ice cubes, but keep in mind that if you’ve already measured the water, ice cubes melt and will add more liquid. 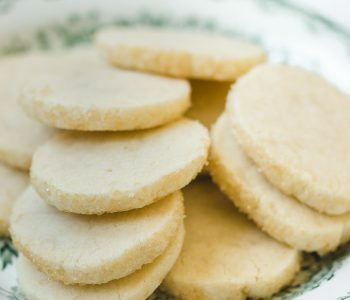 Cold ingredients are important because the longer you work with the dough, the warmer and stickier it gets, the more the butter melts, and the harder it will be to work with it. That’s also why you must chill the dough for at least 30-60 minutes before rolling it out, and to be as quick as possible whenever you’re working with the dough. Also, be careful not to over process the dough. 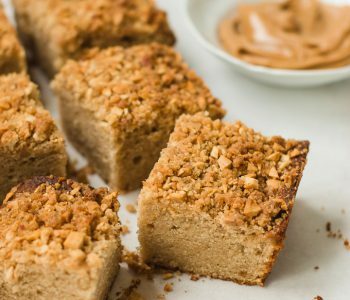 The more you mix it, the more gluten is formed, which results in a tougher crust. We don’t want that; we want a dreamy, flaky, crisp texture. Here are a few photos of the process to show you how the dough is made. No fear, my friends! 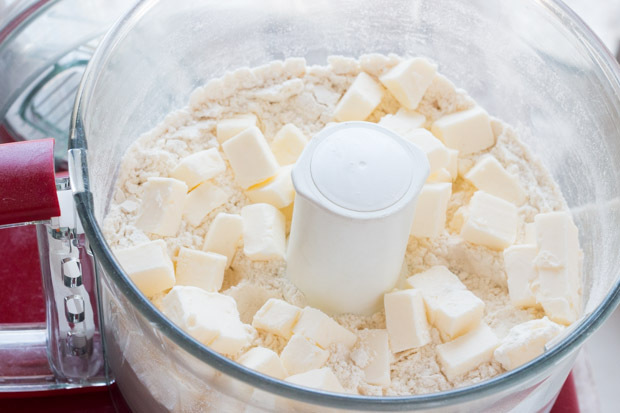 Start by processing flour and sugar in a food processor for a few seconds until combined (Instead of food processor, you can do the whole process by hand, using a pastry cutter). Add butter and pulse until mixture becomes crumbly and resembles coarse meal (different size of butter pieces or some large pieces is fine), about 15 pulses. 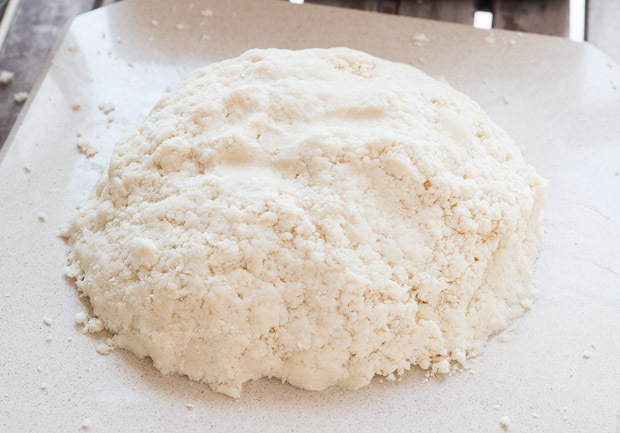 Add 1/4 cup water and keep pulsing, adding more water as needed, one tablespoon at a time, until the dough isn’t dry and starts to clump together. Do not process to the point that a large ball of dough is formed, rather the dough should be quite crumbly with large clumps. 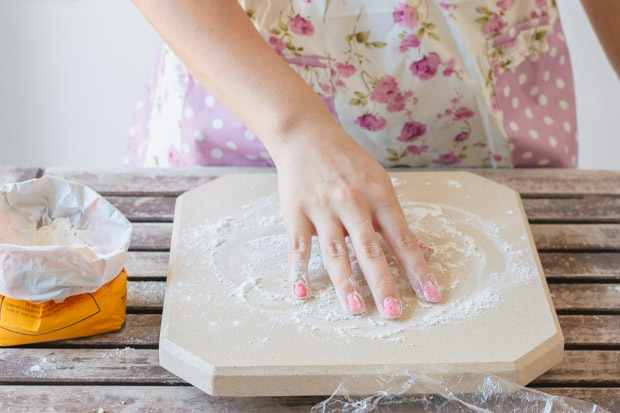 Another way to check if it’s done, is to take a piece of dough and press it between your thumbs – the dough should stick well together without feeling dry or crumbly. 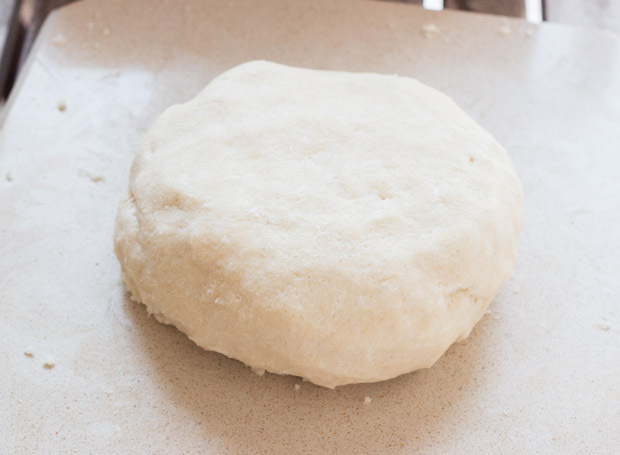 Turn the dough to a floured surface and form into a ball. It should come together easily without being sticky. Flatten each one slightly with your hands to form a 1-inch thick disc. Wrap each disc with a plastic wrap. 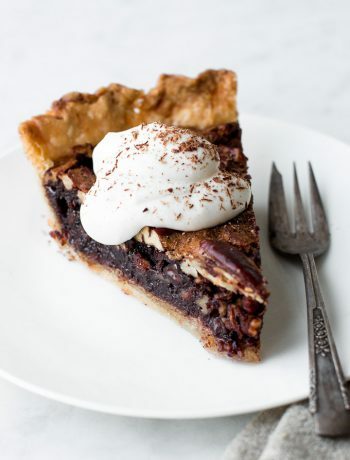 Refrigerate for at least 1 hour before proceeding with your pie recipe. 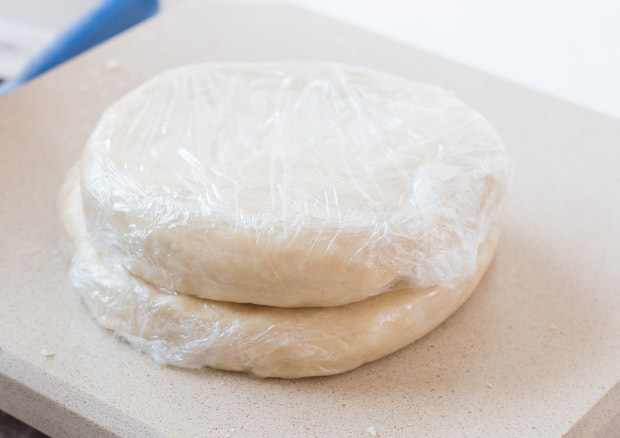 If you don’t want to use the dough right away, you can refrigerate it or for up to 3 days or freeze it for up to a month, then thaw it overnight in the fridge. Process flour, salt, and sugar in a food processor for a few seconds until combined (Instead of food processor, you can do the whole process by hand, using a pastry cutter). Add butter and pulse until mixture becomes crumbly and resembles coarse meal (different size of butter pieces or some large pieces is fine), about 15 pulses. 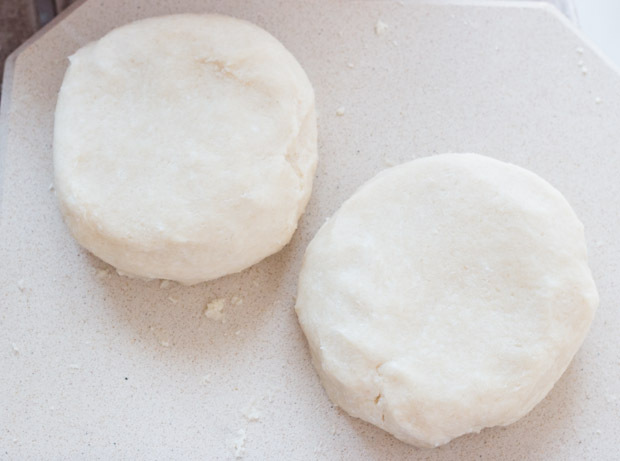 Add ¼ cup water and keep pulsing, adding more water as needed, one tablespoon at a time, until the dough isn’t dry and starts to clump together. Do not process to the point that a large ball of dough is formed, rather the dough should be quite crumbly with large clumps. 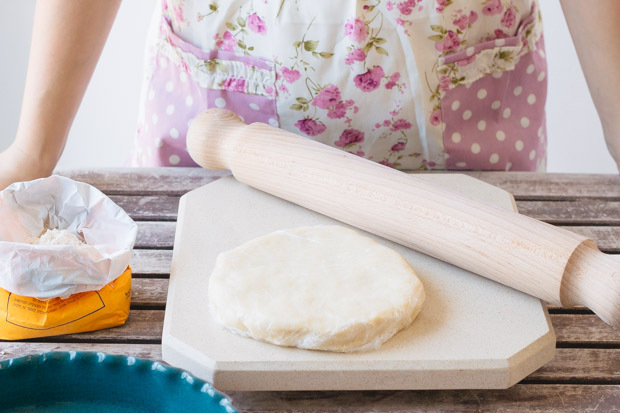 Another way to check if it’s done, is to take a piece of dough and press it between your thumbs – the dough should stick well together without feeling dry or crumbly. 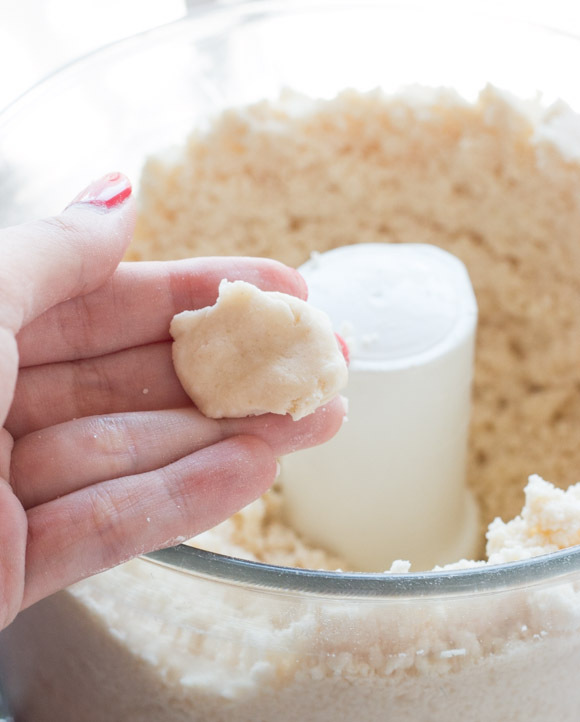 Turn the dough to a floured surface and form into a ball. It should come together easily without being sticky. Divide ball to half, then flatten each one slightly with your hands to form a 1-inch thick disc. Wrap each disc with a plastic wrap and refrigerate for at least 1 hour before proceeding with your pie recipe. 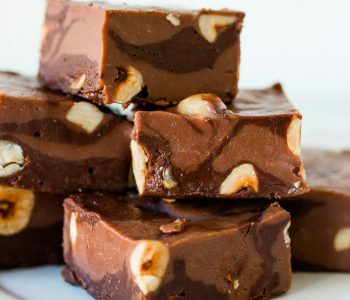 If you don’t want to use the dough right away, you can refrigerate it for up to 3 days or freeze it for up to a month, then thaw it overnight in the fridge. 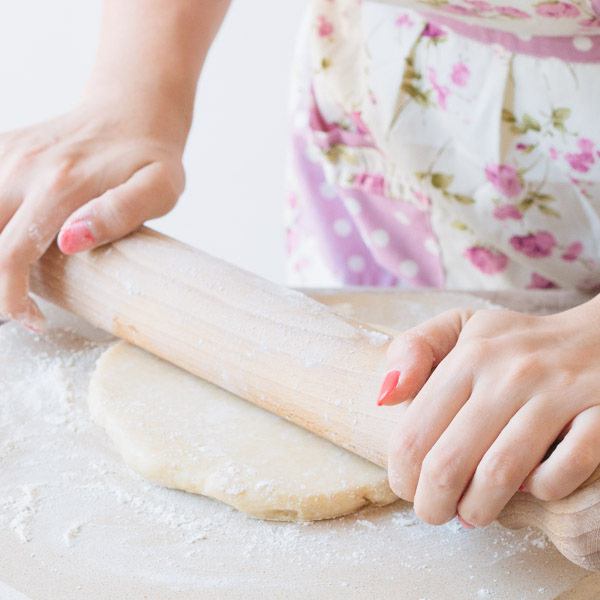 You can’t beat homemade pie crust. I am craving apple pie now. This pie crust really does look perfect! I’m sure it tastes just as good…Yum! Thank you for this tutorial! I really have trouble with pie crusts. 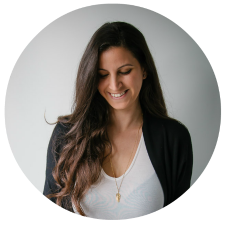 The photos are beautiful, and I can’t wait for your tart recipe! Wow it literally does look perfect! Thanks so much for all the tips I can’t wait to try again using this recipe 🙂 By the way I love your blog! Hi! I’m actually about to start making this dough for your Caramel Apple Pie (canNOT wait to taste it!!! ), but I’ve never made my own dough before… or a pie. ever. Anddddddd I don’t have a food processor. Any quick ideas, or than just driving to the nearest (not near) mall & grabbing a food processor? Hi Katie! 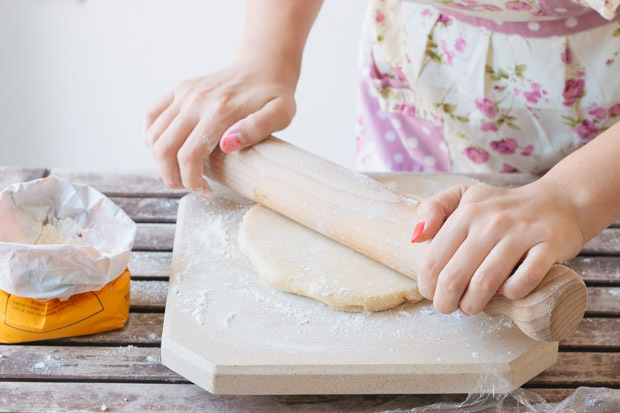 Food processor makes things easier, but of course you can make the dough by hand. Here’s a great video showing you how to do it. Just follow the technique shown there. Hope this helps 🙂 This pie is amazing and so worth it! Good luck! I have read both of your recipes the “lemon tart” and “apple pie”. My question is why the apple pie crust is different than the lemon tart. Can I use them interchangeably? There’s a difference in texture between the two. You can sometimes use them interchangeably but I suggest to stick to the recipes because the crust should complement the filling. Tart crust is crispy with a cookie-like texture, so it complements the lemon tart perfectly. Apple pie, however, goes better with the pie dough which is buttery and flaky. Hi Bernice, I use my recipe for pie dough and it works fine. I’ve tried a few different recipes in the past, but the pies didn’t fall apart, so I can’t say for sure why it happens to you. 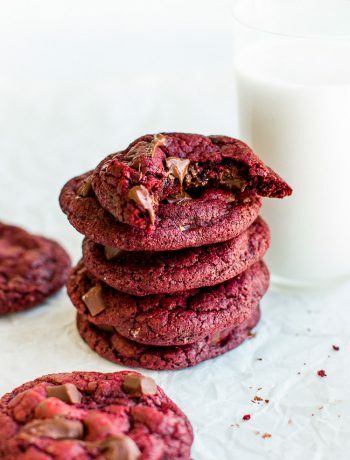 You’re right, biscuit recipes are also great for this. 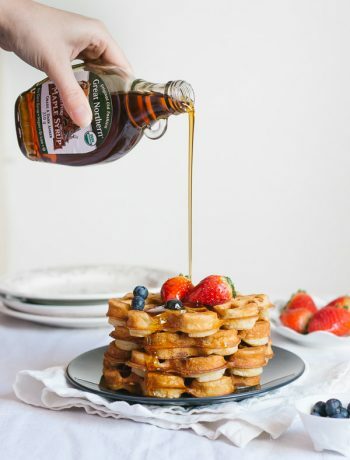 You can try using shortening instead of butter which is more foolproof, or refrigerate the pies so they’re not too soft, and make sure that the oil is very hot. I really love this crust. I cut butter in flour with a knife then used fingers to smoosh together somewhat. Put in fridge about 2 and half hours cuz something came up…took out and let sit on counter about 30 min then have it a couple kneeds before rolling out. Flaky, buttery, yummy!! I really love this crust. I cut butter in flour with a knife then used fingers to smoosh together somewhat. Put in fridge about 2 and half hours cuz something came up…took out and let sit on counter about 30 min then have it a couple kneeds before rolling out. Flaky, buttery, yummy!! I also layed a piece of aluminum foil over pie when turned oven down. Hello! Is there any difference in the recipe for high altitude? I’m in Denver, CO.
Made this and it worked really well. I baked a cherry pie in a large tart pan and the crust held up really well. Who needs a pie pan when you have a sturdy crust! The bottom crust was eve crisp. i’ve made my pastry the night before. How long do I leave it out of the fridge before rolling in for the top and bottom. I used this for my first ever pie crust. It was amazing. The bottom was really crisp and flaky. I had my own Cherry filing and followed your tips for keeping everything cold. My family loved it. Thanks for a great recipe.